JJ HVAC Solutions is a family-owned business that treats our customers like family too. Our Master HVAC Contractor and Technicians have more than 10 years’ experience in both residential and commercial heating and cooling in New Jersey Area. At JJ HVAC Solutions, we believe in providing our clients with high quality service at fair and reasonable prices. You may be able to find what looks like a better deal elsewhere, but before making a decision, we encourage you to consider other factors, such as experience, licenses, Certified technicians and client satisfaction before choosing a heating and cooling service provider. We believe our history of quality work and customer satisfaction, paired with our fair prices and extensive qualifications, speaks for itself.JJ HVAC Solutions is a family-owned business that treats our customers like family too. 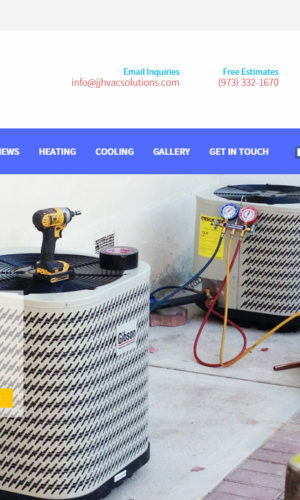 Our Master HVAC Contractor and Technicians have more than 10 years’ experience in both residential and commercial heating and cooling in New Jersey Area. At JJ HVAC Solutions, we believe in providing our clients with high quality service at fair and reasonable prices. You may be able to find what looks like a better deal elsewhere, but before making a decision, we encourage you to consider other factors, such as experience, licenses, Certified technicians and client satisfaction before choosing a heating and cooling service provider. We believe our history of quality work and customer satisfaction, paired with our fair prices and extensive qualifications, speaks for itself.